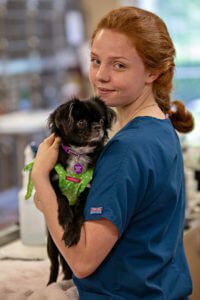 Our 24 hour pet hospital is located in the Greenbrier area of Chesapeake and also serves Norfolk, Portsmouth, Suffolk, Virginia Beach and Newport News, along with parts of North Carolina, including Edenton, Elizabeth City, Eure, Grandy, Kill Devil Hills, Kitty Hawk, Moyock and Nags Head. Emergency: Call ahead to our Chesapeake BluePearl emergency vet hospital and let us know you’re coming. No appointment is necessary for emergency care. Learn more about your emergency visit. 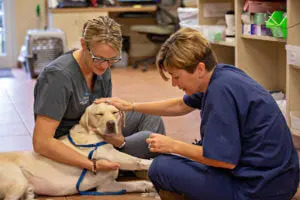 Greenbrier, the BluePearl emergency pet hospital in Chesapeake, is located east of the Greenbrier Mall, with easy access to Interstate 64. Our 24 hour vets and skilled specialists collaborate in a 10,000 square foot facility offering advanced diagnostic tools to include a CT scanner, ultrasound, endoscopy and digital radiography. And for cats, we offer radioiodine I-131 treatment, a nonsurgical approach to treating feline hyperthyroidism.